Wasn’t it Anita Bryant who said, “A day without orange juice is like a day without sunshine”? Is anyone else old enough to remember that one? Well, this is the way I feel about perennials in the garden. You just have to have them. 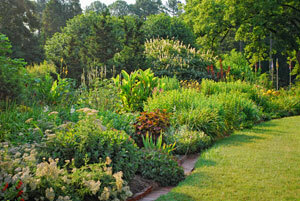 Perennials play such a versatile role in rounding out a garden design or landscape. Perennial plants and flowers come in virtually every shape, size, color and texture. As you observe the natural landscape, these combinations come into play without you even realizing it. As we plan our gardens, perennials are the plants of choice to fill in those lower and mid layers with whatever form, color and texture desired. They are what ties gardens together in a pattern of rhythm, balance and even punctuation. As you work with perennials in landscape or garden design, keep in mind a few important guidelines to ensure a great looking and vibrant, long lasting garden. First, know what growing conditions you have for the area you want to plant. A perennial requiring full sun and well-drained soil will languish in a shady or boggy site, so plan accordingly. Conversely, a plant that prefers shade will appear washed out and stunted when grown in full sun. Next, pick plants that are suitable to your climate. A perennial that’s hardy in zone 7 may die in zone 5, so do your homework first and make sure the plants you like are suited for your region or even microclimate. If you’re unsure, call your county extension service. They will be happy to assist you with appropriate choices and varieties for your climate. As you lay out your garden, plan for the tallest plants and flowers to go toward the back of the border or center of the bed, assuming you have access around the bed. Then plant out from there, layering down, so that the shortest plants are in the front. The best landscape designs use this technique. It allows the garden to appear full while showing off as many plants as possible. Although perennials are beautiful when in flower and can make for a stunning display, the blooms last only a couple of weeks in many cases so plan your design around form, texture and color of the foliage. The best looking designs incorporate diversity and this is where form and texture really come into play. Think of it like this. When perennials are in full bloom, who notices the foliage? However, for the 80% of the time that we see the plants not in bloom, all we see is foliage. Try placing large, thick foliage plants like hosta, just behind the finer smaller foliage of Astilbe or juniper. Or try a tall spiky fern fronted by the dark green, glossy foliage of a wild ginger. You get the idea. It’s fun to experiment with different combinations to incorporate all three design elements. You’ll be a better gardener for it. So, next time you head to the garden center to plan your perennial garden, think beyond the flower and focus on the plant combinations that work well together when not in bloom. You’ll have a garden that looks great even after the flowers fade. During your episode on landscaping, you mentioned that on your website there is a list of native plants and flowers which are grouped by climate, or zone. I am looking for it, can’t find it. Rather unusual setting, my home is in southeastern Canada, 58 acres with slopes and plateaus. I am American, so do not know much about the native species here. I would like some advice on what to do with my road frontage. It is basically flat, cleared for crops some 10 years ago, some ruts in surface. I bought one of those big boxes of wildflower seeds, but got a bad growth of Hogsweed, a poisonous plant. Feel free to email me some suggestions, including cold-hardy flowering perennials.